Messenger photo by Britt Kudla Madeline Myer of Martensdale-St. Marys runs into Libson's Madelyn Morningstar on Monday at Rogers Park. 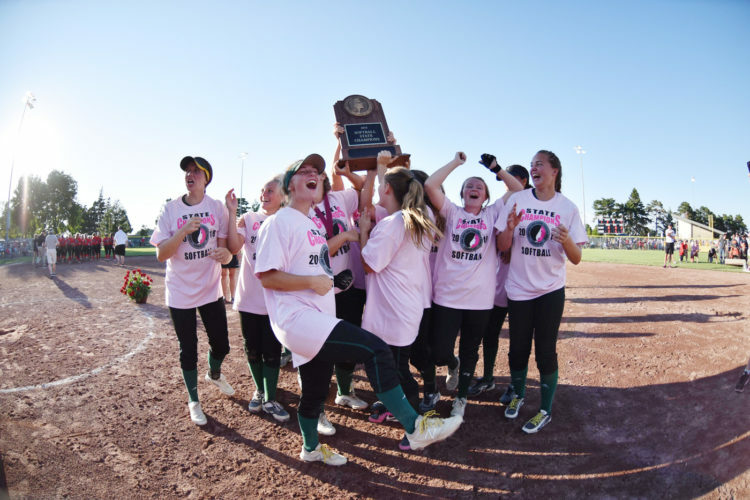 For ninth-ranked Lisbon, the pressure to make it to Rogers Park was daunting. The Lions knocked off two-time defending champion and No. 1 Kee in the regional final to end a 14-year drought from the state tournament. 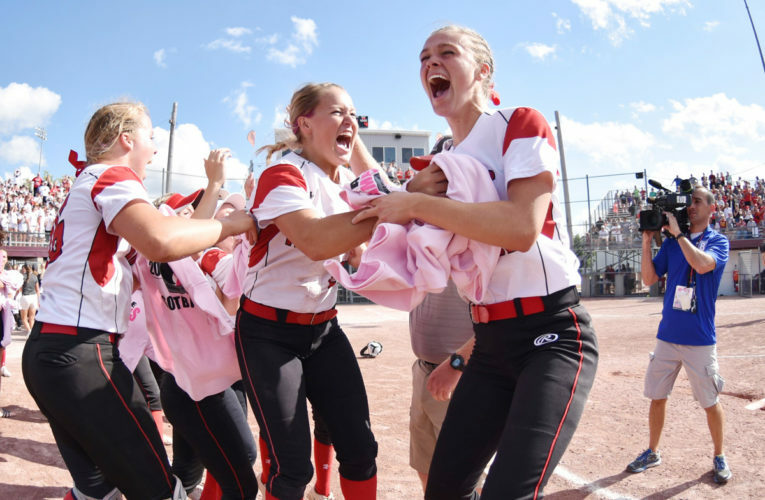 On Monday in the first game on Diamond 2, Lisbon held off 11th-rated Martensdale-St. Mary’s, 3-2, advancing to Wednesday’s semifinal meeting with No. 2 Collins-Maxwell. That contest is set for 11 a.m. on Buena Vista University Diamond. Madelyn Morningstar drove in two runs with a third inning double and that three-run frame held up for the Lions (34-9 overall) against the Blue Devils (24-14). 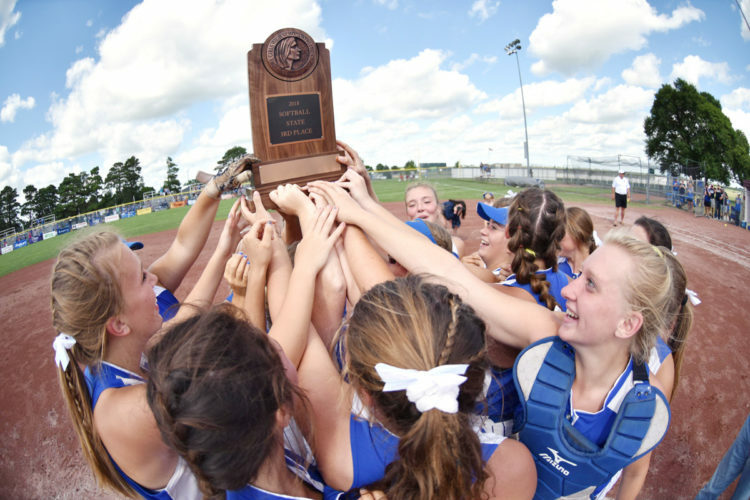 “Getting the first one out of the way is big,” Morningstar said. 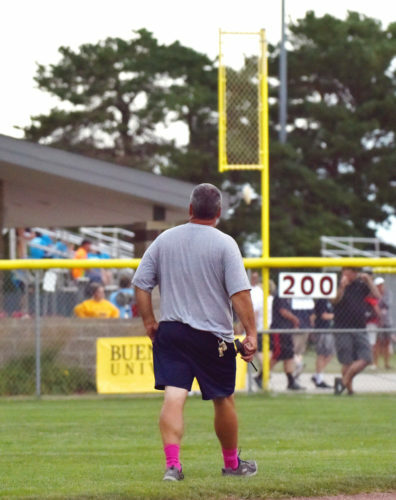 “Coach (Bob Bunting) told us the first one is usually the hardest. We weren’t used to their pitch (speed), but we are here and ready to go. Lisbon’s ace, Skylar Sadler, earned her 25th victory of the season, striking out six and scattering eight hits. 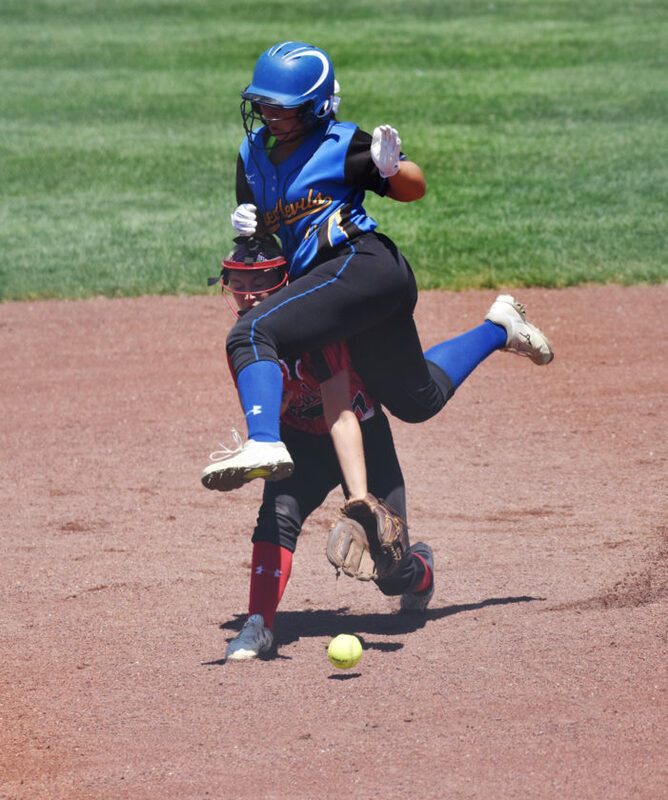 She did not walk a batter and got out of potential scoring situations for Martensdale-St. Mary’s in the fourth and seventh. For the Blue Devils, Jayda Gay and Madeline Myer each drove in runs, but they left eight on base. Kaitlyn Schad and Kailey Walker collected two hits each and Walker allowed just four hits. 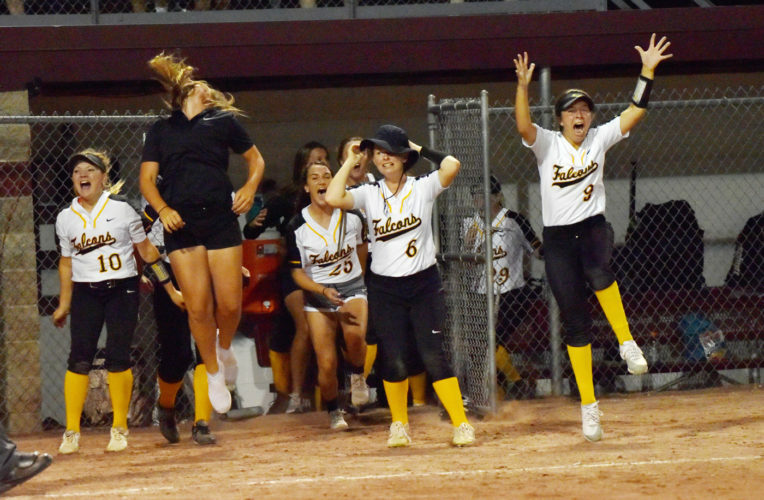 Martensdale-St. Mary’s, who won a state title in 2012, will face Newell-Fonda in a consolation contest on Tuesday at 11 a.m. on Dodger Diamond. This marked win No. 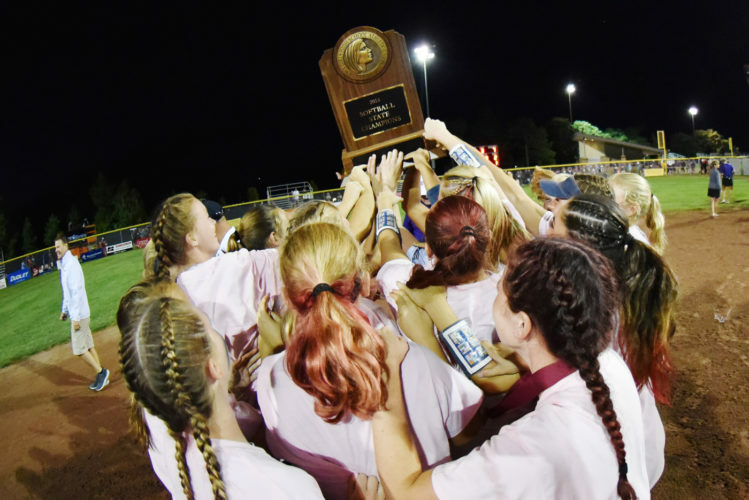 1,161 in the career of Bunting, who was selected as the National Softball Coach of the Year by the National Athletic Coaches Association recently. WP–Skylar Sadler (25-5, 7 IP, 8 H, 2 ER, 6 K, 0 BB); LP–Kailey Walker (6-4, 6 IP, 4 H, 2 ER, 0 K, 1 BB). 2B–MSM: Madeline Myer; L: Madelyn Morningstar. RBI–MSM: Jayda Gay, Madeline Myer; L: Madelyn Morningstar (2), Sam Schrantz.